AV Media Player Morpher (MPM) supports beautiful visualizations while playing music. It's even more great that user can customize and choose which view they prefer among 5 different types of visualizations. - Run AV Media Player Morpher. 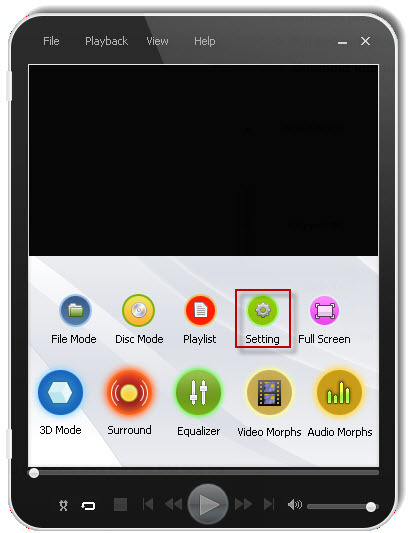 - On main interface, select File menu » Choose Open File... to import audio files to play. - When Open dialog comes out, locate to your music folder and select songs. - On right panel of MPM, select Settings icon. - In Settings dialog box, choose Visualization category on the left. - On the right, there are 5 tabs represents 5 types of visualizations. Further details on how to manage each tab are below. Pick the one that you like to display on player screen while enjoying music. “None” does not mean there's nothing on screen. This type of visualization allows you to simply set one constant image to be displayed on screen. You can use the default image of AV Media Player logo or load any of your favorite photos (Supported formats: PNG-BMP-JPG-GIF-TIFF). 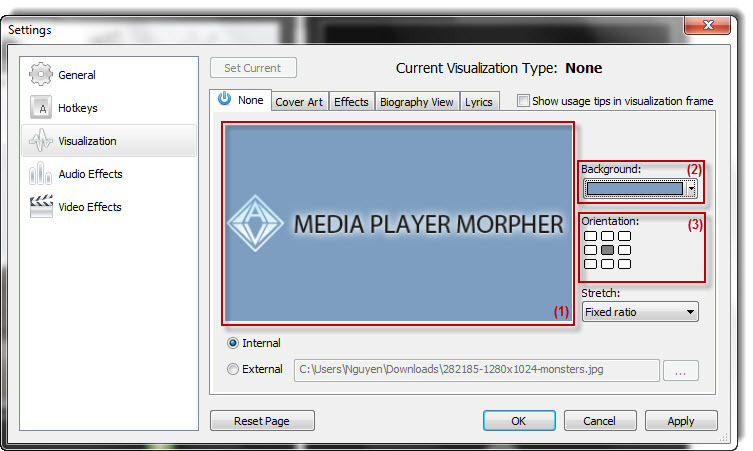 - By selecting Internal, AV Media Player Morpher logo (1) will be the display of the player screen. - Change color of the logo background (2). - Change the position of the logo (3). 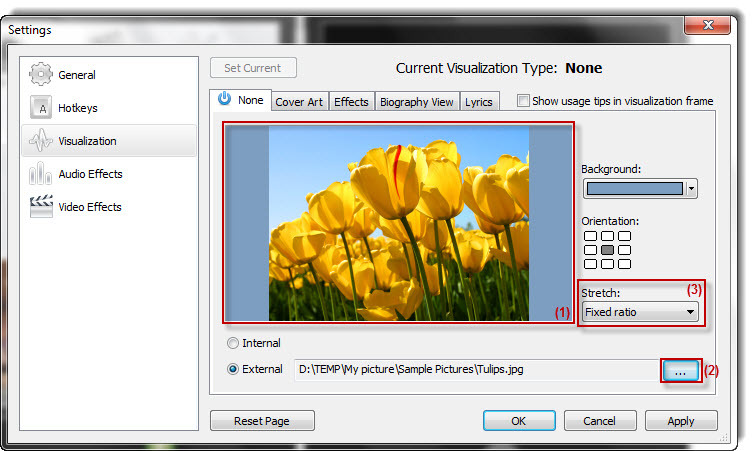 - By selecting External, you can import a photo from your computer (1) to be displayed on player screen. - Click Browse (2) to select a photo. - Select the best view of the photo using Stretch options (3). * Click Set Current to decide using this type of visualization. * Click Reset Page to restore to default settings. * Click Apply to use your settings. * Click Cancel to close settings window without changes applied. * Click OK to close settings windows with changes applied. Photographs and illustrations related to the CD/album cover are also a good choice for the song representation. - Pick color (1) and font (2) for the text displayed. - Change background color (3). - Tick on the cover types that you wish to display (4). - Choose a source to input cover art (5). + None: display no cover art. 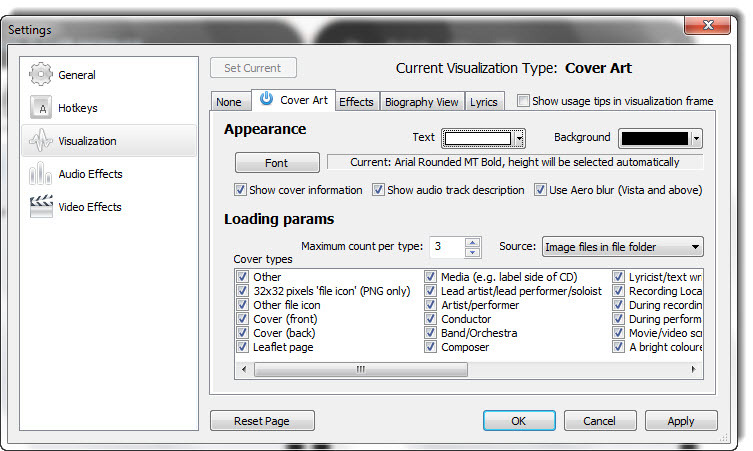 + Audio file tags: only load cover art that embed to the audio files. + Image files in the folder: only load cover art from the same directory of the audio files. + At first tags then image files & At first image files then tags: use both sources above. This type of visualization is an animated graphic that moves according to rhythm of the song. Effects can be splashes of color, geometrical shapes or abstract forms. Beside the existing, users are able to add more effects by downloading from any available sites. 1/ Single: Only one effect repeatedly displays on screen. 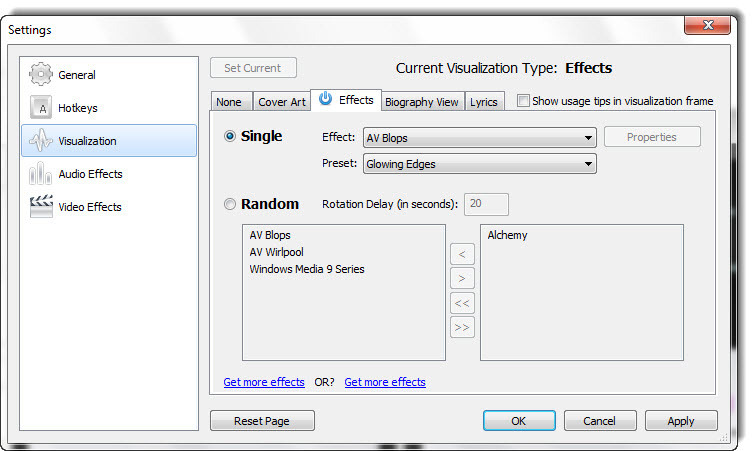 - Drop down the Effect list then the Preset list to pick a effect. 2/ Random: Multiple effects will display randomly on screen. - Use < and > buttons to move/remove a single effect to/from Activated Effects table on the right. - Use << and >> buttons to move/remove all effects to/from Activated Effects table on the right. 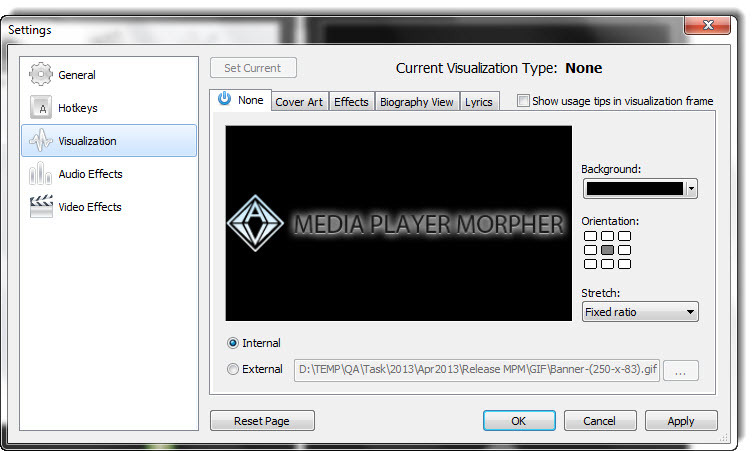 AV Media Player Morpher will get Artist Biography from online database. 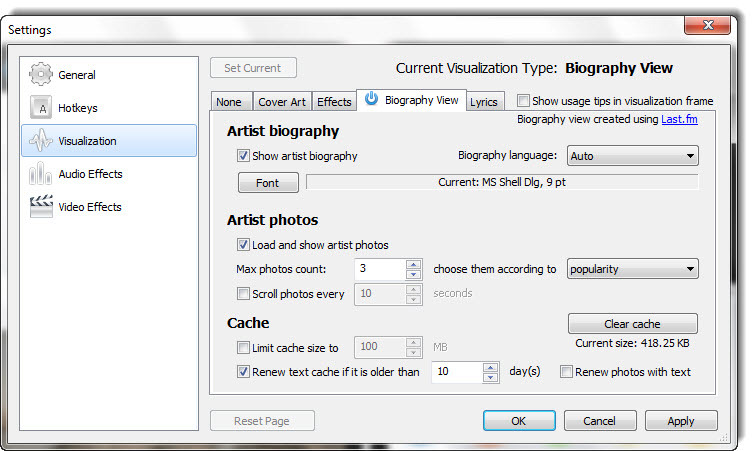 User can customize the biography display and choose whether to view artist photo or not. Within this section you can take further settings on the memory used for storing temporary data get from the Internet. The smaller the cache size, the faster the loading speed. 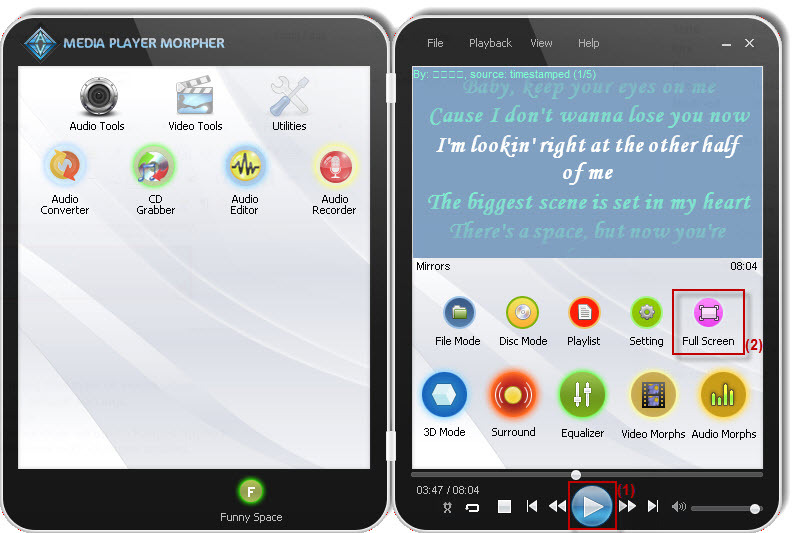 AV Media Player Morpher supports scrolling the song lyrics when playing it. By this way, users can sing along with the singer. 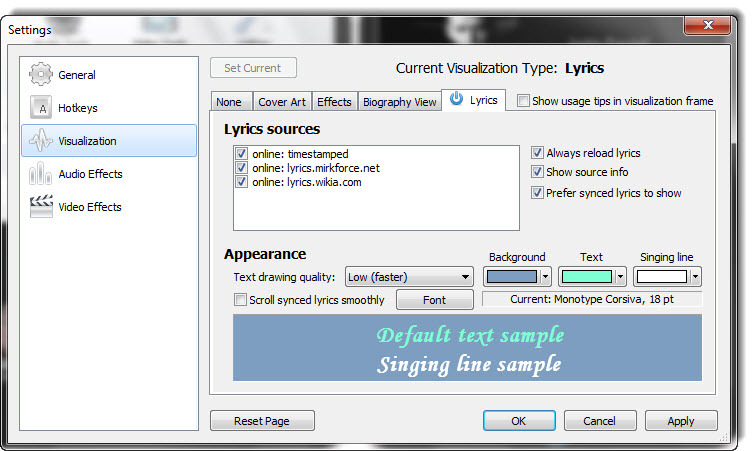 Lyrics are automatically loaded and synced from online databases. - Tick on the online databases that you want to get lyrics from (1). - Always reload lyrics: refresh lyrics information when start playing a song (2). - Show source info (3). - Prefer synced lyrics to show: synced lyrics display first (4). - Choose color for background, entire lyrics and singing line (7). You can preview the change in the small window below (8). On MPM main panel, click Play or press the Space Bar to play music with your customized visualization (1). You can also double click on the screen or click on Full Screen icon to view in full-screen mode (2).